Given its equatorial location, multiple harvests, and ever-changing harvest schedules, there is always a lot of activity on the coffee farms of Colombia, no matter what time of year we visit. Traditionally, Colombia’s coffee producers had two clearly-defined harvest seasons: the primary harvest occurring in the last quarter of the year, from October to December, and a secondary harvest, known as the “fly crop” or “mitaca,” during the spring and early summer (April to June). Traveling in July, a month that doesn’t often appear on the harvest calendars presented on many roasters’ and importers’ websites, I was not sure what to expect, but it became quickly apparent that those calendars don’t tell the whole story. Climate change, paired with often drastic environmental differences from one region to the next, has made the Colombian harvest nearly impossible to predict, and speaking with producers from different areas of the country revealed both the challenges and benefits of farming on the equator. In Antioquia and Risaralda, two departments in the central part of the country, for example, producers were harvesting the final pickings of the mitaca and were already gearing up for the first pickings of the next harvest, due to peak in September-October of this year. Most producers I spoke with said they may have slow months with low yields between harvest peaks, but there is rarely a day with no fruit to pick. As we traveled south to Huila, the harvest was in full swing. Most producers we spoke with were hesitant to call the current harvest “mitaca” as the term implies a lower-yielding season with lower quality coffees. As they explained to me, the line between harvests has become quite blurred and they are essentially harvesting high-quality coffees year-round in the southern departments. Understanding Colombia’s nuanced weather patterns, diverse environmental conditions, and changing regional harvest schedules is clearly a complex topic and perhaps better suited for a future post. I wanted to use the topic as an introduction to these photos, however, because I’ve noticed in my travels to Colombia that it feels like everything is happening all at once in an organized chaos. Harvesting, processing, drying, transport, milling, roasting, retail, export—all happening in concert, all the time. The entire chain operates 365 days a year. There is always fresh coffee coming down the pipeline, and despite its unpredictable nature, the wheels must keep turning. Perhaps their ability to constantly adapt and improve in the face of uncertainty is one of the reasons that Colombia is producing some of the best coffees in the world right now. Santiago Londono hand-pruning a Geisha tree at Mallorca Farm in Valle del Cauca, where he grows primarily Geisha, Caturra, and Bourbon varieties. He has replaced many of the hybrid and resistant cultivars commonly found in Colombia in favor of varieties that he believes will produce the best cup quality. Hand sorting freshly picked cherries at Mallorca to remove underripe, overripe, and potentially defective coffee. Only perfectly ripe cherries will be make it in to Mallorca’s microlot offerings. The rest will be added to lower-grade blends. Natural coffees drying on raised and separated beds at Finca Mallorca. Each lot is closely monitored, and variables like temperature, airflow, and sunlight exposure can be manipulated to promote slow and even drying of the coffees. Dried parchment coffee arriving from a farm in Risaraldo to Asocafe Tatama’s warehouse in Santuario. The arriving coffee will go through green analysis and cupping in order to determine its quality and the coffee will either be rejected or accepted and purchased. Specialty-grade coffees will receive a premium over market value. Due to the limited output of most farms in the area and coffee prices at their lowest in years, many producers view quality improvement as their best chance of increasing income. 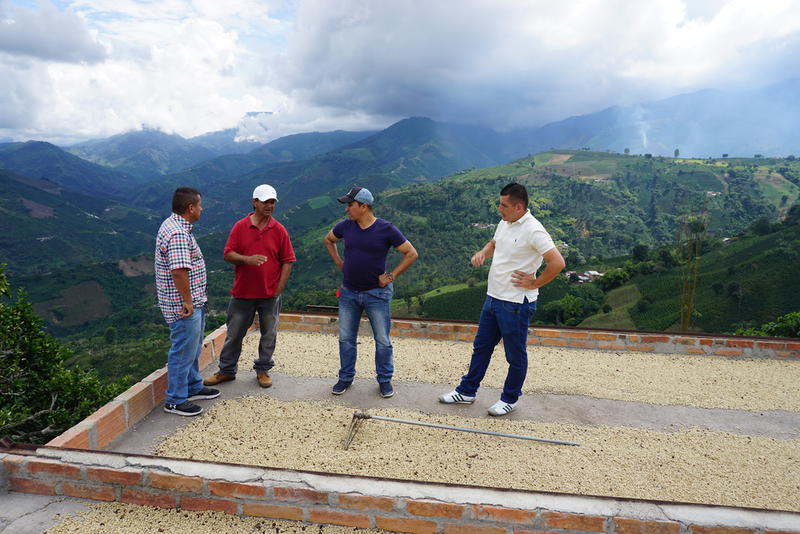 Risaralda producers talking shop on a rooftop drying patio near Santuario. We spent the day with members of six Risaralda growers associations and were blown away by the generosity, support, and knowledge shared among the coffee community in the area. The producers there believe that with their unique terroir and quality improvements they could one day be known as one of the premiere coffee growing regions in Colombia. A view of La Plata, Huila from a farm in Belen. The majority of our current Colombian coffee is grown in these mountains and delivered to the city below for purchase. Their unique coffees are sweet and balanced with strong caramel and citrus notes, a versatile profile featured prominently in our Congress and Republic blends. Parchment coffee at a warehouse in La Plata. The next stop for this coffee is the dry mill where it will be hulled, sorted, blended, bagged, and prepped for export. 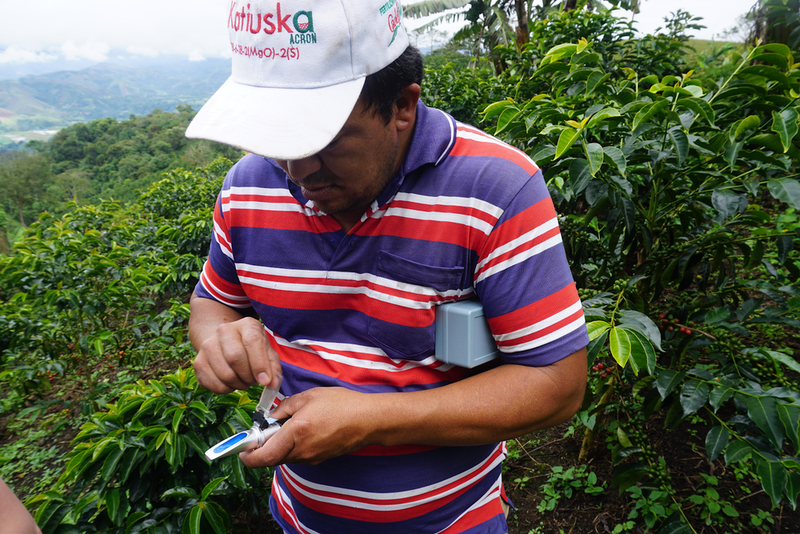 Marco Fidel Rodriguez of Finca El Balcon using a refractometer to take a brix reading from his coffee cherries. The reading represents the amount of sugar present in the fruit’s juice and will help him to determine when his cherries are at optimal ripeness for picking. We had a great time at Finca El Balcon, the birthplace of one of my favorite coffees of the last year. It was a pleasure to bring this coffee back to the farm and to share it with Marco and his family. It was almost as good as the sancocho and arepas that they shared with us. We are eagerly awaiting samples from their current crop and can’t wait to visit again next year!